ITV has confirmed it's in talks to acquire the rights for hit BBC Three show Family Guy when the current rights expire, leading the BBC to finally confirm it will be staying on the BBC until 2017, after remaining tight-lipped on the matter during the recent public consultation on BBC Three. "key popular existing programmes which are currently shown on BBC Three but not on BBC iPlayer will remain on other BBC television channels for the time being." "We would like BBC Three long form programmes (approximately one to two hours a week, at least initially, to continue to have a transmission on BBC One and BBC Two. This further raised doubts over the BBC's long term commitment to such shows on linear TV. Reports suggest that Family Guy may, at least temporarily, move to BBC Two, which until BBC Three was launched was the BBC's home for such content. 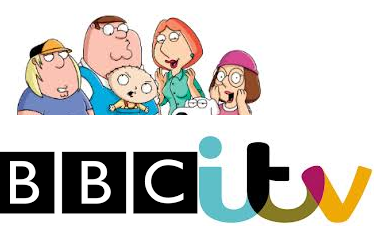 Despite numerous opportunities to state it's proposals over Family Guy and American Dad, including a recent public consultation and various blog posts from senior BBC Executives where questions over Family Guy have been raised time and again, it took an eagle eyed insider to spot a redecorated lift at ITV featuring the Family Guy characters with the ITV logo and subsequent reports across the internet for the BBC to come out and confirm that it will continue showing the animated series after the proposed BBC Three closure until the current rights expire in 2017. BBC Three has shown all series of Family Guy and it continues to be one of the highest rating shows on the channel. Fox also shows the series, where it is also available on-demand via services such as Now TV.